Mendel's principles of segregation and independent assortment are based on the assumption that genes are located on chromosomes in the nucleus of the cell. For the majority of genetic characteristics, this assumption is valid, and Mendel's principles allow us to predict the types of offspring that will be produced in a genetic cross. However, not all the genetic material of a cell is found in the nucleus; some characteristics are encoded by genes located in the cytoplasm. These characteristics exhibit cytoplasmic inheritance. A few organelles, notably chloroplasts and mitochondria, contain DNA. Each human mitochondrion contains about 15,000 nucleotides of DNA, encoding 37 genes. Compared with that of nuclear DNA, which contains some 3 billion nucleotides encoding perhaps 35,000 genes, the amount of mitochondrial DNA (mtDNA) is very small; nevertheless, mitochondrial and chloroplast genes encode some important characteristics. The molecular details of this extranu-clear DNA are discussed in Chapter 20; here, we will focus on patterns of cytoplasmic inheritance. Cytoplasmic inheritance differs from the inheritance of characteristics encoded by nuclear genes in several important respects. A zygote inherits nuclear genes from both parents, but typically all of its cytoplasmic organelles, and thus all its cytoplasmic genes, come from only one of the gametes, usually the egg. Sperm generally contributes only a set of nuclear genes from the male parent. In a few organisms, cyto-plasmic genes are inherited from the male parent, or from both parents; however, for most organisms, all the cytoplasm is inherited from the egg. In this case, cytoplasmically inherited maits are present in both males and females and are passed from mother to offspring, never from father to offspring. Reciprocal crosses, therefore, give different results when cytoplasmic genes encode a trait. Cytoplasmically inherited characteristics frequently exhibit extensive phenotypic variation, because there is no mechanism analogous to mitosis or meiosis to ensure that cytoplasmic genes are evenly distributed in cell division. Thus, different cells and individuals will contain various proportions of cytoplasmic genes. Consider mitochondrial genes. There are thousands of mitochondria in each cell, and each mitochondrion contains from 2 to 10 copies of mtDNA. Suppose that half of the mitochondria in a cell contain a normal wild-type copy of mtDNA and the other half contain a mutated copy ( FIGURE 5.15). In cell division, the mitochondria segregate into progeny cells at random. Just by chance, one cell may receive mostly mutated mtDNA and another cell may receive mostly wild-type mtDNA (see Figure 5.15). In this way, different progeny from the same mother and even cells within an individual offspring may vary in their phenotype. Traits encoded by chloroplast DNA (cpDNA) are similarly variable. In 1909, cytoplasmic inheritance was recognized by Carl Correns as one of the first exceptions to Mendel's principles. Correns, one of the biologists who rediscovered Mendel's work, studied the inheritance of leaf variegation in the four-o'clock plant, Mirabilis jalapa. Correns found that the leaves and shoots of one variety of four-o'clock were variegated, displaying a mixture of green and white splotches. He also noted that some branches of the variegated strain had all-green leaves; other branches had all-white leaves. Each branch produced flowers; so Correns was able to cross flowers from variegated, green, and white branches in all combinations ( FIGURE 5.16). The seeds from green branches always gave rise to green progeny, no matter whether the pollen was from a green, white, or variegated branch. Similarly, flowers on white branches always produced white progeny. Flowers on the variegated branches gave rise to green, white, and variegated progeny, in no particular ratio. The phenotype of the branch from which the pollen originated has no effect on the phenotype of the progeny. 5.16 Crosses for leaf type in four o'clocks illustrate cytoplasmic inheritance. Corren's crosses demonstrated cytoplasmic inheritance of variegation in the four-o'clocks. The phenotypes of the offspring were determined entirely by the maternal parent, never by the paternal parent (the source of the pollen). 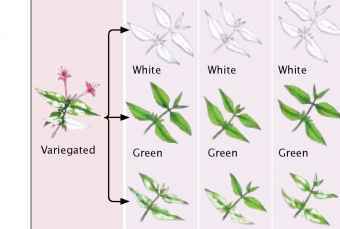 Furthermore, the production of all three phenotypes by flowers on variegated branches is consistent with the occurrence of cytoplasmic inheritance. Variegation in these plants is caused by a defective gene in the cpDNA, which results in a failure to produce the green pigment chlorophyll. Cells from green branches contain normal chloroplasts only, cells from white branches contain abnormal chloroplasts only, and cells from variegated branches contain a mixture of normal and abnormal chloroplasts. In the flowers from variegated branches, the random segregation of chloroplasts in the course of oogenesis produces some egg cells with normal cpDNA, which develop into green progeny; other egg cells with only abnormal cpDNA develop into white progeny; and, finally, still other egg cells with a mixture of normal and abnormal cpDNA develop into variegated progeny. In recent years, a number of human diseases (mostly rare) that exhibit cytoplasmic inheritance have been identified. These disorders arise from mutations in mtDNA, most of which occur in genes coding for components of the electron-transport chain, which generates most of the ATP (adenosine triphosphate) in aerobic cellular respiration. One such disease is Leber hereditary optic neuropathy. Patients who have this disorder experience rapid loss of vision in both eyes, resulting from the death of cells in the optic nerve. Loss of vision typically occurs in early adulthood (usually between the ages of 20 and 24), but it can occur any time after adolescence. 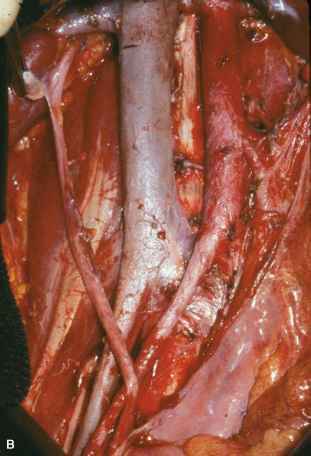 There is much clinical variability in the severity of the disease, even within the same family. Leber hereditary optic neuropathy exhibits maternal inheritance: the trait is always passed from mother to child.